Click, Click, Click...what can cameras teach us? 1. Something with the alphabet. 2. Something with animals. 3. Something bumpy. ​4. Something musical. 5. Something we can build. 6. Something reflective. In coming weeks we will make our own pinhole cameras from scratch and develop our photos from disposable cameras to see which ones that we want to display at the the PS1 art show on May 2. ​On Friday, we captured the happy faces of the afternoon crew. We combine the afternoon only kids with the extended day kids for music, art studio, story theater, classroom play, and outside time if the weather permits. The afternoon goes so very fast and many times kids don’t want to leave when their parents come. But alas, the next afternoon comes soon enough! All children explore music and movement. Arlo often takes it to the next level of expression, especially when asked to strike a pose during "Find the Dance" with Lauren. He loves books, art, and always, always: rainbows. Kazu is a little sneaky guy when I try to take his picture. I can still get him to laugh and then I use my "stellar teacher photo skills" to capture a smile. He is learning English as we engage in his favorite preschool activities. His favorite thing will always be the trains, but I often find him playing with my son George, who also loves trains! Clara just joined us in October, but she's for sure an avid "preschool explorer." She readily is up for any activity no matter where we are going and what we are doing. We've recently spotted her in the art studio painting on the easels. It's fun to talk with her about her painting, color choices, and how there is a "story" in every painting. Thanos helps all of us use our best imaginations! If he is not acting like his favorite large cat, he is painting a Power Ranger in the art studio and telling us a story about it! All of his characters have many details about their looks and personalities! Anya has so many interesting things to talk about the minute she arrives! She sure is a storyteller! She delights in all art activities, and spends a lot of time in the Art Studio with Jen. The best part is when she is done with a creation, she must show everyone and tell a story about it! Rowan comes into school ready to go! Ready to go for him means using our music room to "get moving" especially when we can do thing like throw snowballs! His love for building structures and sculptures is always tapped in the the Art Studio. To wind down you will find him in our book area looking closely at books, with a smile. To the library we go! Inside, we gathered at a table and met our library tour guide, Angela Pilkington, the Children’s Service Coordinator. She gave us a wonderful tour of all parts of the library. 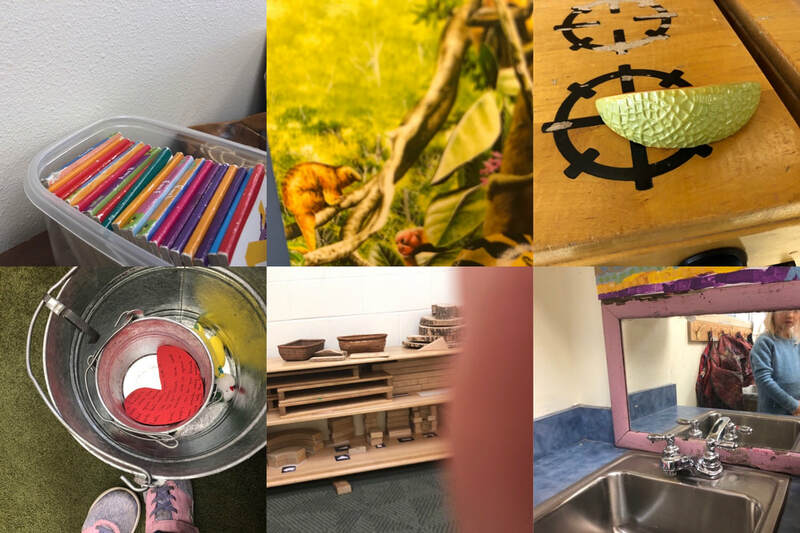 We even got to go behind the scenes (like backstage at the Englert Theater) and see how librarians put together Story Time materials and how books come back into the library and get checked in to return to the shelves. In the Children’s Section, we learned where things are and how to search for and check out our own books! This came in handy later when we looked up books for our idea project. We also got our own personal story time with librarian Casey Maynard. Our books and song and fun stories all had to do with fall and Halloween. Imagine that! A special thanks to Clara’s mom, and Thanos’ mom, for being extra hands and teachers at our field trip. We couldn’t have done it without you! We not only witnessed firsthand the real butterfly process at school in the butterfly cage, we truly explored the steps with Lauren and Catharine in movement class. We started by reading a book on caterpillars and picking our favorite one to pretend to be. We then laid on the ground as a little egg and hatched onto our leaves. We inched around like the caterpillars for a bit then bent in half to become a chrysalis. We slowly emerged when the time was right, spread and dried off our wings, Then flew!!! Afternoon movement class with Lauren was an adventure with parachute play! We created an alphabet out of wooden letters. We painted them first. Then we went on a nature walk to discover nature items that we can use to collage. The letters will be displayed under the window in the 5-day classroom all year long. We have been working on our letters as well. Simply noticing how our names are spelled and the letters we see in the classroom. Afternoons at Preucil provide an extension to the morning. If participating in Afternoons-Only, children have the opportunity to explore all that is Preucil—music, play, art, outdoors, etc. Our afternoons are full of enriching activities and extended learning opportunities. Afternoon-Only children start their afternoons in the music room where they greet their teacher and participate in an opening activity, followed by music with Lauren. They then join the morning children who are staying for afternoons. 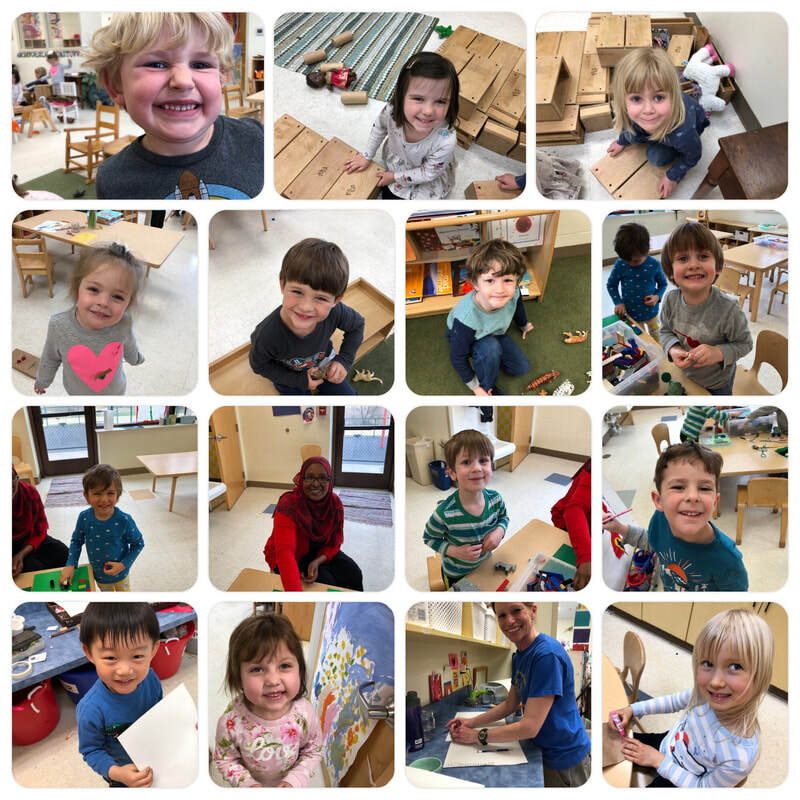 Classroom play and exploration, open art studio, music creation, mindfulness, and peaceful rest are all possibilities during the afternoons. Children develop their interests and expand their experiences. Children who stay all day extend projects and learning from the morning to go into more depth. Afternoon-only children have some time for group activities with their teacher and each other. We all enjoy stories together and end our day outside for large motor play or quiet reflection in our green space. Friendships are formed, ideas are expressed, and creativity and learning are fostered.